Are there ways to improve compliance, safety, security, operational efficiency and information quality in international trade? Reduce the administrative burden for business and government? Foster the uniform application of Customs legislation? Encourage mutual understanding between the public and private sector, and even share responsibilities in the fight against smuggling, terrorism and criminal organizations? We believe there are, but to do so there is a need for people who are knowledgeable in various disciplines. 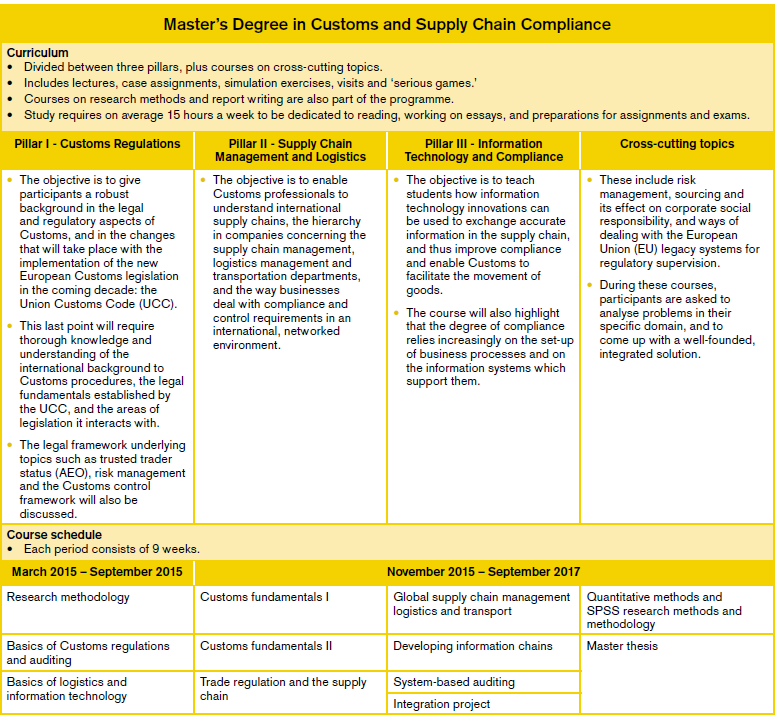 The Master Degree in Customs and Supply Chain Compliance developed by the Rotterdam School of Management offers this type of education by integrating three disciplines: Customs regulations; supply chain management and logistics; and information technology and auditing. In this article, we discuss the objectives of the degree and the educational philosophy of the programme, and reveal some of the lessons learned in setting it up. The work of a Customs professional is changing, and is filled with new challenges. Trade networks have grown in complexity, and transport and logistics services have been redistributed and optimized, with benefits depending on enhanced reliability and cost reduction. However, the capacity to ensure transparency and monitor the flow of goods has not kept pace with these changes, leading to risks for the general public, in terms of safety and security, and most probably also in terms of lost Customs duties and a decrease in quality of service. A typical regulatory response to such a situation would be to impose stricter regulation and tighter controls. The downside is that this increases the administrative burden for businesses and the regulatory costs for governments, already under pressure due to budget cuts. Customs is, therefore, required to improve its overall performance; inspecting more effectively while at the same time reducing interference in logistics processes. As a result, Customs is now on a quest to find a new, optimum balance between trade facilitation and enforcement, as well as innovative solutions to achieve this balance. Almost a decade ago, the WCO identified the need for this change and developed a visionary model, the SAFE Framework of Standards to Secure and Facilitate Global Trade. Subsequently, research was initiated by several parties into innovative solutions for trade facilitation and improved compliance, one of which led to the development of the ‘Data Pipeline’ concept to improve data visibility. The important underlying idea, known as piggy-backing, is to re-use reliable commercial data for regulatory control, where possible. Other important issues include the various forms of coordinated border management (CBM) – for example, the ‘one-stop-shop’ that integrates Customs inspections with other border controls such as food and product safety inspections – and the development of an electronic Single Window (i.e., the re-use of reporting data for different administrative agencies). These kinds of solutions make use of the information technology (IT) deployed by a network of public and private partners. Therefore, they can only be developed by Customs in close collaboration with businesses and service providers across the entire supply chain, and with other regulators such as tax offices or food and health inspection agencies. Where enforcement strategies are concerned, the focus is increasingly being placed on ‘trusted trader’ programmes, ideally enabling resources to be freed up and better supervision of non-trusted traders. This change in enforcement policy has also triggered the adoption of new forms of auditing and inspection, such as system-based auditing. Here, authorities increasingly rely on a company’s own system of internal controls for monitoring and reporting compliance. In this case, authorities must supervise the effectiveness of the control system, at a meta-level. In the Customs domain, a well-known example of the use of system-based auditing is the certification process for an Authorized Economic Operator (AEO). Customs officers used to be primarily focused on the physical inspection of goods, and were trained in practical inspection that included legal knowledge, while the business professionals in charge of Customs issues were trained to classify goods and fill in declarations. But today, the increasing complexity of regulatory demands, the reliance on IT and the adoption of new supervision models with integrated risk management and control, all require Customs professionals with specific skills. Traditionally, Customs professionals have taken the ‘long route’ when it comes to education. They are trained on-the-job and also follow various training/vocational courses and internal educational programmes in a wide variety of disciplines. This approach is no longer sufficient to satisfy the demand for Customs experts, as knowledge and expertise requirements have become much more demanding. In the past, Customs inspection was to a large extent a physical activity, whereas nowadays it also includes the carrying out of audit-related activities which require knowledge of business processes and traders’ commercial drivers. This new role requires education programmes that help existing Customs personnel to further develop themselves in order to cope with these new challenges. And clearly, these part-time programmes are of a higher academic level than was traditionally required in the Customs profession, for the reasons stated above. On the other hand, business professionals dealing with Customs issues need, in order to be compliant, in-depth knowledge of the legislation in force, the risks involved and the control measures to be implemented, including those touching on the company’s information systems. Developments have put Customs-related issues ‘in the boardroom’ and these professionals need to work at a strategic level, with detailed knowledge of the impact of Customs regulations on processes. Both categories of professionals need to acquire a broader knowledge of the environment in which they execute their work. In addition, both need to be able to look beyond the boundaries of their own discipline, in order to take advantage of new opportunities and transform them into feasible solutions. To respond to this educational need, the Rotterdam School of Management developed the Master Degree in Customs and Supply Chain Compliance, in close collaboration with Delft University of Technology, Erasmus University’s Rotterdam Law Department and Eindhoven University of Technology. The programme integrates three disciplines or ‘pillars’: (1) Customs Regulations; (2) Supply Chain Management and Logistics; and (3) Information Technology and Auditing. It is open to representatives of Customs administrations and other government agencies dealing with trade, inspections and trade facilitation, as well as to business representatives. As the programme is aimed at working people who are only able to study on a part-time basis, the courses are spread over two and a half years, with employers generally paying the tuition fees. The programme is built on the competency framework for the Customs profession developed by the European Commission (EC). Courses are taught in English and are open to professionals from around the world. Entrants who are not university graduates need to follow a pre-Master preparatory course. In terms of recognition, the programme gives entitlement to 60 European Credit Transfer and Accumulation System (ECTS) points, which is equivalent to a total of 1,680 hours of study. The pre-Master course gives another 12 ECTS points. The curriculum has been developed in close cooperation with the Customs Administration of The Netherlands and trade associations, and is one of the many offspring of the close collaboration in innovation and research projects established between Dutch Customs, universities and representatives of the business community. A unique feature of the current programme is the ‘learn with and from each other’ educational philosophy: an equal number of students from Customs administrations and the private sector are selected to create what are called ‘communities of learning,’ which can be defined as ‘groups of people who share a concern, set of problems or passion about a topic and who deepen their knowledge and expertise in this area by interacting on an ongoing basis’ [Wenger, McDermott, & Snyder, 2002, p4]. Working in such a heterogeneous environment helps students to obtain a much deeper understanding of the study material, and enables them to better understand each other’s concerns and contribute to more effective collaboration between Customs administrations and Trade. It is preferred by employers, who would rather have their employees absent for a week once every six to eight weeks, rather than for one day every week. The challenge of educating a student population with heterogeneous backgrounds and expertise while at the same time allowing for flexibility regarding study location and study time, led to the design of a special blended learning programme in which online education is combined with a week of full-time, physical classroom training at the Rotterdam School of Management. Hence, every course module in the programme starts with a six-week online preparation phase, followed by an intensive, one-week residential phase, and then a final, three-week phase during which students complete their final assessment. In the six-week preparation phase, students read the textbooks, articles and case descriptions, and watch video lectures produced by the teachers. Furthermore, the teachers organize regular video conferences with all the students to answer questions about the study material that the students have not been able to solve by themselves. The residential phase is a four-day session of classroom meetings that are primarily focused on a very interactive learning mode where teachers and participants jointly apply the knowledge to a wide variety of cases; this includes lectures from teachers and practicing guest lecturers, workshops, student presentations, discussion sessions and collaborative team work on case-studies. Talented people who choose to work in, and specialize in the Customs field must be given access to good education. This stresses the need for more Bachelor and Master-level education programmes in the field of international trade, border management and supply chain management, which should be open not only to experienced Customs professionals, but also to other students. the incorporation of the current pre-Master preparatory course – which is compulsory for non-graduate entrants – into the Bachelor degree, building on the existing collaboration with some Dutch universities for applied sciences in the setting up of a Bachelor degree programme for professionals who are not Customs officials, but are working for the government or the private sector in the area of cross-border management of goods. To face the challenges of the future, educational programmes in the Customs domain should evolve. In particular, education should try to make use of the insights offered by scientific research into Customs issues, thereby further stimulating the academic study of Customs-related issues around the globe. 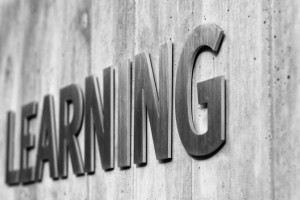 Education should no longer be focusing on the legal aspects of Customs regulation alone, but should instead integrate this knowledge into studies that include supply chain management, information technology and auditing. Moreover, education should foster a multidisciplinary attitude that encourages collaboration between government and businesses, and across the various disciplines, while strengthening the ability to spot new developments, identify opportunities and translate them into practice. Last but not least, educational efforts should lead to a recognized degree. We believe that by establishing this new Master Degree in Customs and Supply Chain Compliance, including the upcoming Bachelor degree, we are heading in the right direction.